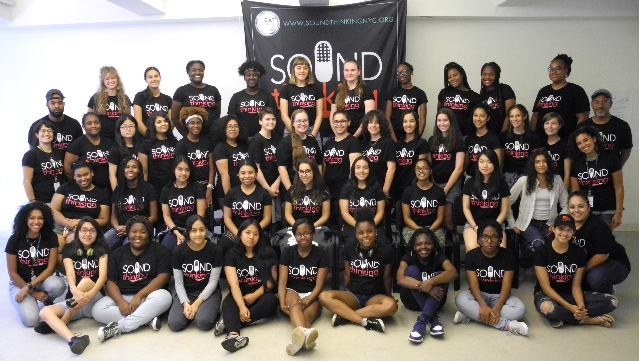 Designed by Dr. Jeanne Houck, Sound Thinking NYC debuted in July 2018 with a cohort of 39 New York City 11th and 12th graders, selected from applicants from 32 high schools. While not specifically girls‐only, the program is designed to address gender disparity in the music industry and provide a space for young people to explore their passion for music and to gain skills they can take into their professional lives. Participants explore the diverse careers available in the music business—from producer to promoter to sound engineer—and learn about how higher education plays a role in achieving those careers. Through the three‐week summer intensive, participants are exposed to a curriculum that includes specific skills related to the music industry, while also focusing on building career readiness and leadership skills. School‐year workshops will include both students from the summer intensive as well as additional participants. These workshops will address cohort building, mentoring and skill building related to workforce development and college readiness. Houck, who has a background in music history and gender studies, began developing Sound Thinking NYC several years ago. When she became executive director of the Creative Arts Team (CAT) based at the City University of New York (CUNY), she tapped into CAT's extensive history of drama‐based workshops, leadership development and social emotional learning to complete the program design and execution. Houck initially developed the program and its structure with Justin Kalifowitz, CEO of Downtown Music Publishing. The NYC Mayor's Office for Media and Entertainment has fully funded the program for four years and helped build networks of mentors eager to participate. While participants may enjoy performing, the program is focused on what happens behind the scenes and taking that passion for music into a career pathway. Sound production became a foundation of the program. The methodology used is participant‐centered, promoting critical thinking and examining issues young people encounter. For the first summer intensive in July 2018, along with the hard skills of production and programming, students discussed how to navigate gender equity issues in the music industry and build leadership skills for the future. 2018 Sound Thinking NYC cohort and educators. During the three‐week summer intensive, there were field trips to recording studios and a jazz museum and exposure to the career possibilities in the music business, such as publishing and copyrights. In terms of hard skills, a sound engineer created a curriculum of Pro Tools and sound design. It was coupled with CAT teaching actors who use applied theater activities to deepen the students' understanding and mesh hard skills with soft skills, such as social emotional growth. In addition to discussions about skill‐building and gender‐equity issues, CAT actor‐teachers led workshops about creating community within the group and developing strategies to deal with real‐life issues they may face in the music industry. Each Friday during the summer intensive, there were mentoring panels, in which the students heard from individuals in the music industry. They were able to ask questions about the different careers, including entertainment law, media, composing and arranging, sound and tour management. There were also speed mentoring rounds, where seven students sat at a table with a mentor and asked questions about that person's career. By the end of the three‐week Sound Thinking NYC summer intensive, students had learned the basics of how to use the industry standard Pro Tools, which can be used for sound recording and production. On the final day, there was an invited audience as each student had a two‐minute produced Pro Tools performance attendees could listen to on headphones and the students spoke about what they'd produced. McCants says participants left the intensive feeling confident about their abilities to create tracks using Pro Tools. They not only have the skills, but also the understanding and ability to talk about the skills. Going forward, participants will have the opportunity to take a four‐credit college course in sound production during their final year of high school free of charge through CUNY's College Now program. “We opened the conversation that there are pathways in higher education, and our students were very receptive,” says McCants. The cohorts will be larger in ensuing summer intensives, with capacity for up to 100 students in 2019 and 2020. Male high school students are eligible. A couple of boys were offered positions this year, but they had to decline due to other summer commitments. Houck says all those who meet the qualifications and embrace gender equity may apply, and there will be greater gender diversity moving forward. Sound Thinking NYC communicates regularly via newsletter and email with the students from the summer intensive and their parents, announcing opportunities. This initial group of participants will continue attending workshops and mentoring events throughout the 2018–19 school year. Five workshops will be exclusive to the 39 students in the cohort, and four will be open to a wider number of people in the community. In the future, CAT will offer some paid internships for summer intensive graduates who have completed the school‐year workshops. Mentorship is ongoing. Sound Thinking NYC career goals panel. For more information about the program, check out their website at https://creativeartsteam.org/programs/sound‐thinking‐nyc. Like what you see here? Click here to subscribe to Women in Higher Education, available in print and online!